You look at your iPhone wallpaper dozens of times per day. This can serve as a good reminder as you go about life. It can be something to remind you of the beauty in the world (or in your life). Or it could be something motivational, breathtaking, or just plain funny. 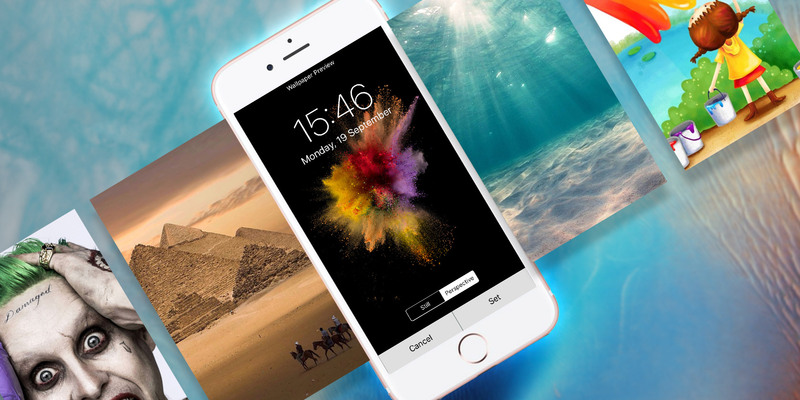 Your wallpaper is one of the easiest ways to visually customize your iPhone. That’s why we’ve got the best collection of iPhone apps that will help you find your next wallpaper, whether you’re looking for something meaningful or quirky. Vellum has handpicked collections of beautiful wallpapers from artists and designers all over the world. In the sea of wallpapers available online, Vellum serves as a filter. The app sorts through the cruft and presents you with the best ones, curated and grouped in lists. There’s the starter pack of the original collection, a collection just for OLED iPhones, a set of geometric shapes, a group of images from the European Space Agency, and so on. Vellum lets you preview a wallpaper and you can save it to Photos app with just a tap. Unsplash is a popular free stock image site where most awesome iPhone wallpapers come from. But you might not want to go through the thousands of photos on the site to ones suitable for the iPhone screen. This is where the Unsplash app comes in. Open the app and you’ll be presented with collections, featured photos, and featured creators. Browse around and when you like a wallpaper, just tap on the Save button. Patternator is a fun wallpaper creation app that brings the iMessage sticker trend to your Lock screen. You can create awesome patterns out of stickers. Choose multiple stickers from the app’s collection, or create a sticker out of your own photos. Patternator’s pattern creation tool is incredibly intuitive to use (it’s similar to Instagram’s photo editing interface). You can pick multiple stickers and patterns, define the spacing, pick the background color, and more. Once done, you can either export it as an image, video, or GIF. The image option is the best for most users. But you can go one step further and export it as a Live Photo as well. This way, when you 3D Touch on your iPhone’s Lock screen, the pattern will animate. However, this exporting to Live Photo requires a premium subscription that costs $ 2/month (although there is a seven-day trial available). Clarity is an exquisitely designed wallpaper app. If you’re a designer or just appreciate good design, you’ll love using this one. The app’s dark background and minimal styling really bring out the beauty of the images. I’ve used many wallpaper apps, and have found Clarity’s Featured collection one of the best yet. The photos highlighted are objectively excellent, and don’t adhere to a particular style or color palette. The app curates some of the best images online. Twice every week, it releases a magazine with handpicked images. But what I love the most about Clarity is its wallpaper editor. Tap on the Edit button and you’ll see four tools: Mask, Frame, Gradient, and Blur. The Mask tool lets you add a gentle filter to the top of the image to make it ready for the Lock screen (in a way that the time is always legible). Frame lets you pick an image and puts it in a frame at the bottom two-thirds of the wallpaper. This looks great on the Lock screen, without getting in the way of the time. Meanwhile, the Gradient tool lets you pick a color and edit the gradient (this is a great way to create a soothing Home screen wallpaper). And the Blur tool adds a subtle blur over any image. Papers.co is the perfect feed-based wallpaper app. Just open it and you’ll see the new wallpapers in an infinitely scrolling grid. Keep looking until something catches your eye. Then tap on the image, hit Save (or favorite it), and you’ll find it in the Photos app. You can swipe in from the right edge to sort wallpapers by categories like Nature, Pattern, Abstract, and so on. Everpix makes use of the whole screen. When you open the app, you’ll see a new wallpaper every time. Swipe left to see the next wallpaper. Find something you like? Tap on the Download button to save it or the Star button to add it to your favorites. Open the hamburger menu to see categories, favorites, popular wallpapers, and more. Walli is an artist-based wallpaper community. Artists upload their original artwork and you can download them to use as wallpapers for free. If you’re tired of the same wallpaper photos from Unsplash or Google Images, browse through some of the categories in Walli. While it doesn’t have a huge collection, there are a lot of quality wallpapers here. You’ll find some amazing superhero pictures, lettering art, portraits, and travel photos. Atlas Wallpaper is for the cartographer in you. Type in a city or give the app a location and it will create a cool outline-based map. You can pinch and zoom, or pan around. For a different look, try switching the color scheme as well. If you like what you see, save it as an image on your iPhone. Atlas Wallpaper can be a great way to remember where you’ve come from, or where you’re going. WLPPR has the best collection of breathtaking images of the world. If you’re a space fan and like looking at top-down views of planets, WLPPR is a must have. Other than the original space collection, you can view photos from Mars, images from satellites, shots of the Virgin Islands, and more. You get the original and Mars collection for free. You can unlock a specific collection by paying a dollar, or get access to everything by paying $ 4. Background is a beautiful curated wallpaper client for Unsplash. Open the app and simply start scrolling to see the latest photos. If you find it tiring to sort through the Unsplash app to find photos that work well as an iPhone background, start using Background. When you’ve found a wallpaper you like, just tap and hold to save it to Photos app. The free version lets you explore the feed and save photos. To search for photos and add them to favorites, you’ll need to buy the premium version. You’ll find many awesome sources for wallpapers other than the apps listed above. If you’re looking for amazing yet unique wallpapers, find designers that you like and look at their social media profiles. They might just sell a wallpaper pack online. AR7: AR7 makes some of the best topical, geometrical, and gradient-based wallpapers for the iPhone. And he’s got something new every couple of weeks. Follow him on Dribble to see the latest wallpapers. iWallpaper Subreddit: More than 65,000 redditors routinely share their favorite wallpapers on this subreddit. Subscribe in your favorite Reddit app and keep checking in for new wallpapers. There are many more websites that feature fun and quirky wallpapers. You can download fun movie wallpapers, breathtaking landscapes, or create your own pattern wallpaper on the web.